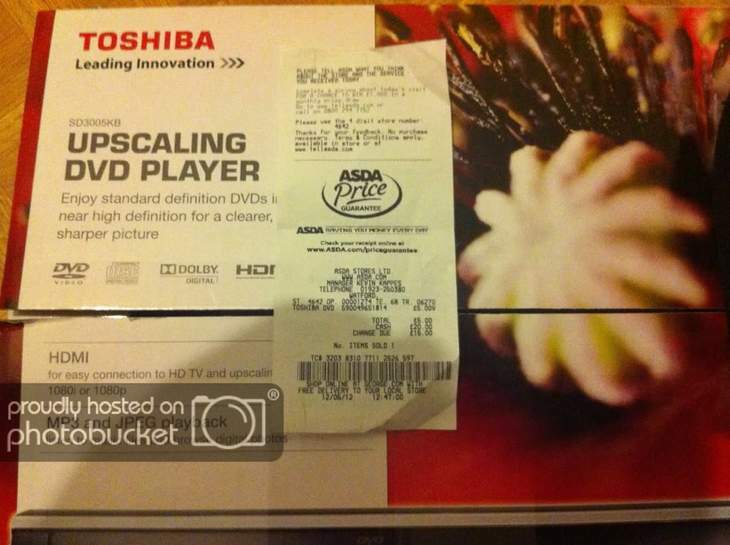 I saw the post about this DVD player for £10 the other day, I went into asda Watford today and they had stacks of the 3010's that has dts for £25 and I saw this at the front of the pile I thought I'd take a gamble and took it to the counter the checkout girls eyes nearly popped out of her head when it rang up as a fiver! I have the receipt and a picture of the box if you want I just have to try and upload it! Not sure this will work but here should be the pictures? Cash £20.00, pay £5.00, change £16.00? Something does not not work. It's a 5, just a bad photo. Hmmm... and "kevin kappes" store manager when we all know kevin is in Spain this week. 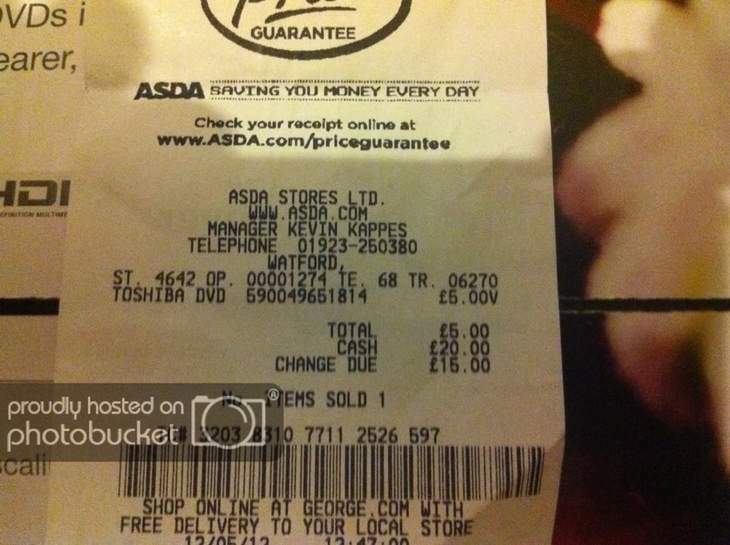 Was the price tag a fiver too? Ho ho ho, I wet the bed laughing! could have updated my deal thread for further price reduction as same item and same retailer! well spotted anyway. Sorry G I'm still not exactly sure how to do most things on here and I didn't think of it either! no worries - glad others have found the deal as some stores still seemed to be full price. maybe shelf tickets not updated everywhere? Just got one in Wisbech, price tag on shelf said £37 something, got sales assistant nearby to scan and went thru at £10 - still good price. Obviously yours is not very good either when you missed the exact same joke was posted. I bought one of these at Xmas time when my other Toshiba (older model from Argos) went belly up after 13 months. It packed in after 3 weeks, wouldnt turn on etc and i took it back to Asda and exchanged for another. The replacement had this annoying skipping problem on certain dvds (mainly the wifes Friends boxset) yet the same discs would play fine in my two bluray players. Went to update the firmware to see if it would help and i killed the machine by flashing the wrong firmware apparently. Needless to say i binned it and wouldnt touch another of these. Maybe a faulty batch. Obviously yours is not very good either when you missed the exact same … Obviously yours is not very good either when you missed the exact same joke was posted. Priced on the shelf at Asda Middlesbrough as £37 as earlier poster said, but scanned for £15 so I bought it anyway. Just picked one up for £10 in Asda Belfast (Shore Road). They had it priced at £37 and change, but got it price checked and it turned up at £10. I got the last one in Asda Hatfield for £5 at around 1pm. It was in amongst the other model numbers on the shelf - it was pretty hard to distinguish them apart. Nope. I didn't bother reading the thread actually. I have just bought one of these as a early fathers day present,it was with other toshiba models & there was no price,got it scanned & came up at £15,shame it wasnt £5 but still not a bad price. I cant see anywhere on the box if it plays Divx discs,can anyone who owns one please confirm it if does? I dont want to open it as it is a present,Many thanks.